A 3 Dimentional Chess expansion board game. I can say with 100% certainty that chess is a perfect game and any attempt to change it or improve it will end up an inferior game to “CHESS”. 3D War is not as good a game as chess, but if you know how to play chess and would like a bit of “additional entertainment” then 3D War will make a great game for you. The rules are almost identical to chess and game pieces are the same, just more of them. In order to play 3D War players will need, 4 black and white chess set pieces, the “3D War:tm” Game boards and game rules. 3D War:TM is a three dimension, strategy board game. 3D War:TM is played by 2 people. Ages to play 3D War:TM are 12 to adult. Playtime for 3D War:TM is 60 to 120 minutes. 3D War incorporates 2 game boards. Each of the 6 different kinds of pieces moves differently. Pieces cannot move through other pieces and can never move onto a square with one of their own pieces. However, they can be moved to take the place of an opponent's piece which is then captured. Pieces are moved into positions where they can capture other pieces by landing on their square and then replacing them, defend their own pieces in case of capture, or control important squares in the game. Once a player makes a move with a game piece, then that play is over and it is the opponents turn to make a move. Once a player makes a three dimensional move, with a game piece, from one level to another level ,it finishes that move. A player can not move [from level to level] and [ on one level] in the same move. A player can not capture his own pieces. The kings can only move one square in any direction - up or down in a diagonal direction or vertical direction or horizontal direction. The king may also move one square at a time, on a single plane diagonally or vertically or horizontally forward and backwards. If the King captures an opponent's piece the move is over. The queen can move in any one straight direction - forward, backward, sideways, or diagonally on a single plane or [up or down], as far as possible as long as she does not move through any of her own pieces. if the queen captures an opponent's piece her move is over. The castle may move as far as they want, but only vertically or horizontally on a single plane or [up or down] as far as possible as long as it does not move through any of its own pieces. . If the castle captures an opponent's piece the move is over. The bishops may move as far as they want, but only diagonally on a single plane or diagonally up or diagonally down. Each bishop must stay on its own color during a move. If the Bishop captures an opponent's piece the move is over. Knights move going two squares in one direction, and then one more square at a 90 degree angle, just like the shape of an “L”. This move can be done on a single plane or [up or down] . Knights are also the only pieces that can move over other pieces. If the Knight captures an opponent's piece the move is over. Pawns move forward or backward on a single plane or [up or down] on a move, but capture diagonally in a forward or backward move on a single plane or [up or down]. Pawns can only move one square at a time. Pawns can only capture one square diagonally, on a single plane or [up or down], in front or back of them or[ above or below]. If there is another piece directly in front or back of a pawn, on a single plane he cannot move past or capture that piece. If the pawn captures an opponent's piece the move is over. A players Pawns can only capture an opponents pawns. Pawns in chess have a special ability and that is that if a pawn reaches the other side of the board it can become any other chess piece (called promotion). There is no castling in 3D War . Castling in Chess allows a player, on his turn to move his king two squares over to one side and then move the castle/rook from that side’s corner to right next to the king on the opposite side. The Idea of the game is to capture and/or checkmate the opponent’s 4 kings. Checkmate happens when a king is put into check and cannot get out of check. An opponents first 3 Kings must be captured and the opponents last King may be captured or checkmated. The players game pieces reaches a stalemate. A stalemate is when ether player is unable to capture or stalemate the other players last king. The players may simply agree to a draw and stop playing. Or there are not enough pieces on the board to force a capture/checkmate of the opponents last King. Placing the game pieces on the game board to start the game. 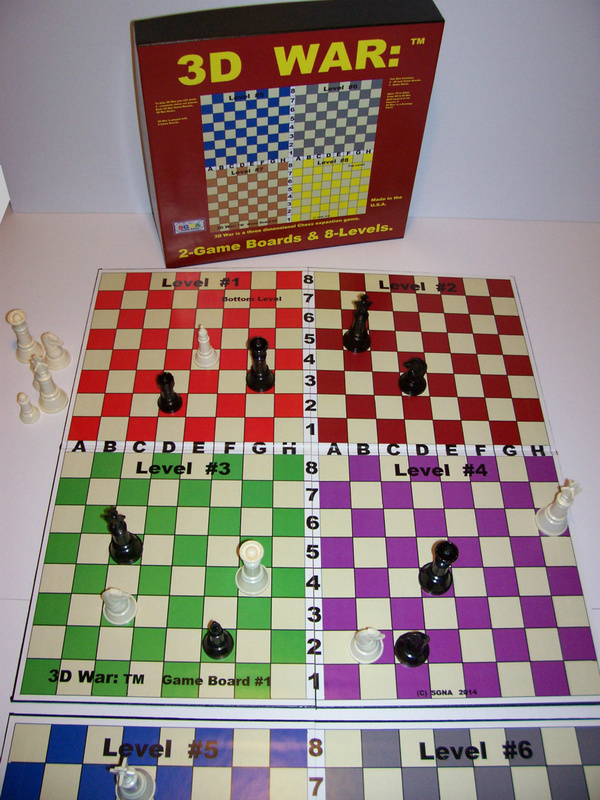 Level '2' and level '4' and level '6' and level '8' are set up with game pieces, in exactly the same way a chess board is set up at the start of a game, a white square is in each player's near-right corner, and a colored one in the near-left, on each level. Each player controls forty-eight pieces,32 pawns, 4 Queens, 4 Kings, 8 horses, 8 castles,8 Bishops. Each players Queen is on her own color. On each level, the major pieces are in the first row and the pawns are placed on the second row. The 1st, 3ed, 5th, 7th, levels of the game boards is set up with out playing pieces on them at the start of the game. First place the playing board on a table, the players sit on opposite sides. 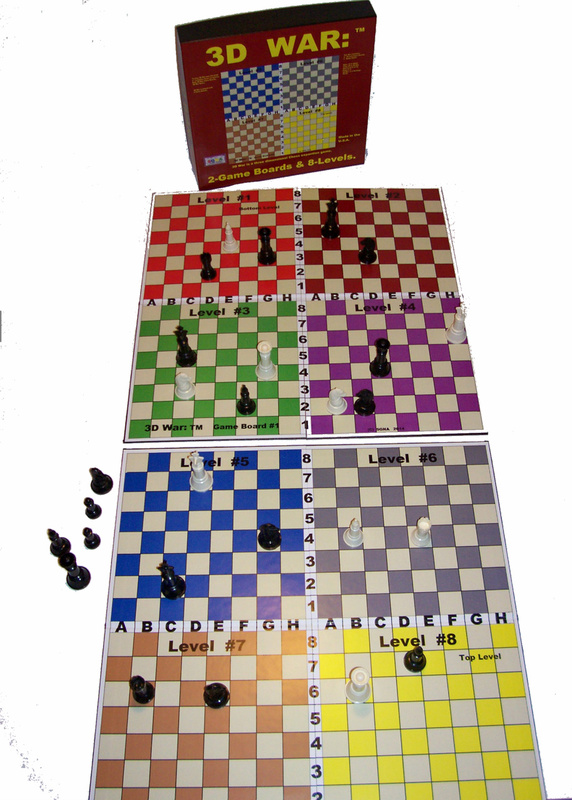 Each player picks a color of playing pieces to represent him on the playing board. The players then place their game pieces on their correct squares to start the game. White moves first. The first player to capture the 4 Kings of his opponent Wins the game. 3D War: © SGNA, 2014.